After nearly two decades, the Supra is officially back. 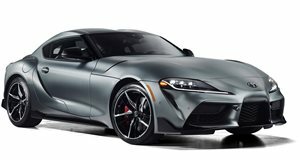 After what seemed like an interminable ramp-up, Toyota finally lifted the veil off the new Supra a few months ago at the 2019 Detroit Auto Show. But none of that means anything until it actually starts rolling off the assembly line. And that, as the Japanese giant has now confirmed, is just what began this earlier month. The first unit off the line was actually sold only weeks after its debut, for over $2 million, at Barrett-Jackson's auction in Arizona. Apparently, the one shown at the event is not the one the deep-pocketed buyer will get to keep. This one is decked out in the same color scheme of matte gray with red mirror caps, matte black wheels, carbon-trimmed red interior, and an engine cover signed by Akio Toyoda. Now that it's out of the way, though, the rest of them can start rolling off the line as well, with deliveries slated to commence this spring. Unlike most of Toyota's products, the Supra is not built at one of its own plants. Instead, it's manufactured under contract by Magna Steyr in Austria, along the same assembly line that produces the jointly developed BMW Z4 (production of which began in November). "It was exciting to see the first Supra roll off the line!” said project chief designer Nobi Nakamua, part of a team of engineers that traveled between Japan and Austria numerous times over recent months to make sure everything was in order. "Though we had our set of challenges, we believe this Supra will show the passion, thoughtfulness, and commitment that we have all had as we designed this iconic sports car and can't wait to see both old and new Supra fans all over the world on the roads soon."